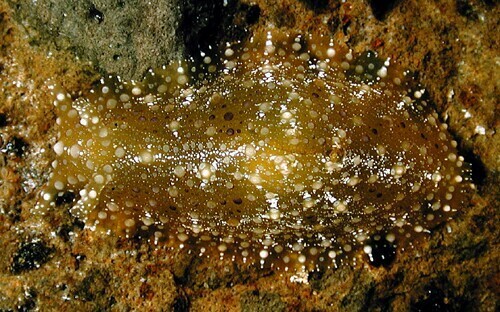 Identification: This sea hare can appear long and slender when crawling or broad and ovate when resting. It has numerous round to conical tubercles on its notum and, in Hawaii, it ranges from translucent yellow to translucent yellow-brown. White granules are embedded in the notum with some forming a longitudinal medial line. The larger tubercles are tan and more numerous, the smaller ones purple and ringed with purple. Some of the tubercles have papillae extending from their tips which may become dendritic (or more elaborate) with age. The four tubercles on the parapodia enclosing the mantle cavity are usually the most intricately branched. Natural history: Petalifera ramosa is a moderately common nocturnal species. It has been found in moderately exposed rocky habitats and in moderately protected Halimeda kanaloana beds at depths of 6-33.5 m (20-110 ft). It has also been reported form the intertidal (Gosliner, et. al. 1985). It is sometimes seen in the water column at night swimming by extreme dorso-ventral flexing, the head and tail touching with each undulation. Taxonomic notes: It was first recorded in Hawaii from the Kewalo Basin, Oahu by Terry Gosliner in Aug. 1973. Photo: PF: 35 mm: Makena, Maui; May 16, 1995.